The temporomandibular joint (TMJ) is located at the lower jaw where it meets the temporal bone. Temporomandibular joint disorder (TMD) occurs when the joint shifts out of proper alignment. Different nerves pass through the face and jaw area, TMD can create pressure or irritation in these nerves, creating a variety of symptoms, some of which may appear to have no relation to the jaw at all. These symptoms may reveal other serious problems, so it’s important to find a dental specialist who is familiar with all the symptoms, causes, and treatment options for TMD. Jaw pain or clicking in the joints while chewing or speaking are common symptoms of TMD. A shift in the alignment of the TMJ can occur due to a variety of issues with tooth alignment, stress, body tension, and bone structure. Successful treatment of TMD takes all these factors into account and often combines several approaches for the best possible outcome. 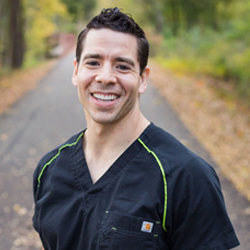 Dr. Del Toro will help assist you in deciding what is the optimal treatment based on your conditions. A full mouth reconstruction, rehabilitation or restoration, restores all the teeth in both the upper and lower jaws through a combination of multiple procedures, including dental implants, bridges, and crowns. These series of dental treatments may be necessary if your teeth have been severely damaged or lost due to decay, severe wear, or injury. Teeth grinding is a common symptom of TMD. Patients with this problem often receive a custom-made mouthguard to wear at night. This mouthguard helps reduce damage caused by nighttime grinding. Teeth grinding is a symptom of TMD, but can also occur as a result of TMD. The stress of everyday life can create numerous symptoms throughout the body, including teeth grinding and tension in the facial muscles that pulls the TMJ out of proper alignment. Dr. Del Toro can teach patients a variety of easy habits to reduce such stresses in small, but cumulative ways. In severe cases, surgery might be necessary to restructure the TMJ. This is usually a last resort after less invasive treatments have proven to be ineffective. If you are experiencing persistent symptoms that could be related to TMJ issues and TMD, contact our Paris, Texas dental office to schedule an informative consultation. Dr. Del Toro will discuss your symptoms, probable causes, and possible treatments. A consultation will help you achieve the most accurate diagnosis and the best treatment path for your specific TMJ and TMD concerns.